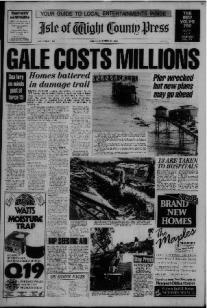 You can search the Isle of Wight County Press archive for free, but you will have to register and pay to view the pages. We offer a subscription package, ideal for family history, in-depth and project research, starting at £5.95 for two days*, or a credits package for light and occasional use which starts at £4.95 for 20 credits (pages). Click here for more details on packages available and to register. You can search using just a keyword or keywords, which will look through the entire archive. You can refine your search using the Advanced search function and search a specific date range, section of the newspaper and search solely front pages, or exclude front pages. For more information on searching and advice on how to get the best results go to our How to search page. Microfilm of the County Press newspaper has been scanned and converted to image files (high quality jpegs) and are then processed with optical character recognition (OCR). This creates digital text which is put in a database and is searchable. The digital text OCR creates is not 100 per cent accurate. The accuracy depends on the quality of the original film, the style of the font, the size of the font and the design of the text on the page. The OCR scans all text on the page so you may be delivered results from adverts. If you come across errors in the OCR text please let us know via the Contact us page and we will endeavour to correct this in the database. Pages from 2006 onwards were created as digital files and these are searchable without the need for OCR. Pages scanned from microfilm will be a lower quality image than the pdf pages. The County Press will continue to add editions to our online archive, giving readers access to the whole newspaper up to two months ago. • Photographs were not published in the County Press until September 27, 1924. • During the first and Second World Wars there was limited reporting on war-related incidents due to national security. There was a regular News from the War column which included information on injuries to service men and women, but there were not reports on bombings or plane crashes on the Island during the wars. • Until the mid 1970s the front page of the newspaper was made up of announcements and adverts. January 1974 was the first time the front page featured news. • There were no editions of May 3 and May 10, 1980, due to a newspaper production staff strike. • The County Press was published on a Saturday until 1981. The first Friday edition was the January 2, 1981 paper. • The entertainments section, Weekender, was launched on February 24, 2006. • The County Press went to full colour in March 2006 and moved to tabloid format on October 3, 2008. • The style of family announcements varies, depending on the type of announcement and year. Go to our search tips page for advice on finding family announcements. We offer two sizes of prints of pages, A3 for £16.20 and A2 for £25. There may be occasions where there is 'show-through' on a page. This is when you can see on one page what was printed on the other side of it. This is a result of the opacity of the paper and the weight of the ink used when the paper was originally printed and subsequently scanned. If you want to purchase a page that has 'show-through' we will do our best to reduce this, before the page is printed. Unfortunately there is a small selection of pages missing from our archive.